Hello, finally! As always, I have been incredibly busy and haven't had a lot of time to take outfit photos, but I received this lovely dress from Romwe last week and I had to post a look with it! So incredibly, I am obsessed with baroque prints right now. They are absolutely beautiful. My tumblr is full of reblogged baroque inspired photos, and I just can't stop! Romwe has so many AMAZING things in stock right now, and they want me to share some exciting news - they are having a halloween sale from October 26th to November 1st - You can get $20 off orders of $100 or more with the code halloween20. There are also a ton of items on sale for 60% off. 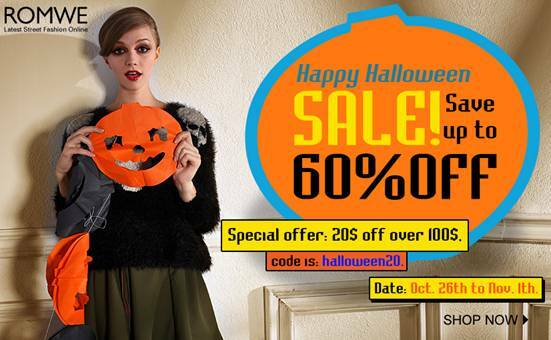 Click on the banner below to link to the halloween sale page. Hope everyone is having a wonderful autumn.